The post Captivate 2019 – All the Ways to Get it appeared first on eLearning. Are there any silent installation options for the Captivate 2017 release Patch 1 (10.0.1.285) for a silent installation? I didn’t get any help with /? etc. and I’m not seeing anything online. The post Captivate 2017 release Patch 1 (10.0.1.285) silent installation appeared first on eLearning. Recently one of my colleagues upgraded Captivate to the latest release, 10.0.1.285, and since then whenever she publishes to HTML5 and then launches the index file the project starts and pauses on a blank slide that is NOT part of the project. After considerable testing of her instance, my instance and an instance from a 3rd user in our team I had her reload the previous version 10.0.0.192. The problem went away. I intern updated my version to 10.0.1.285 and am experiencing the same issue of the exported project launching and pausing on a blank screen. 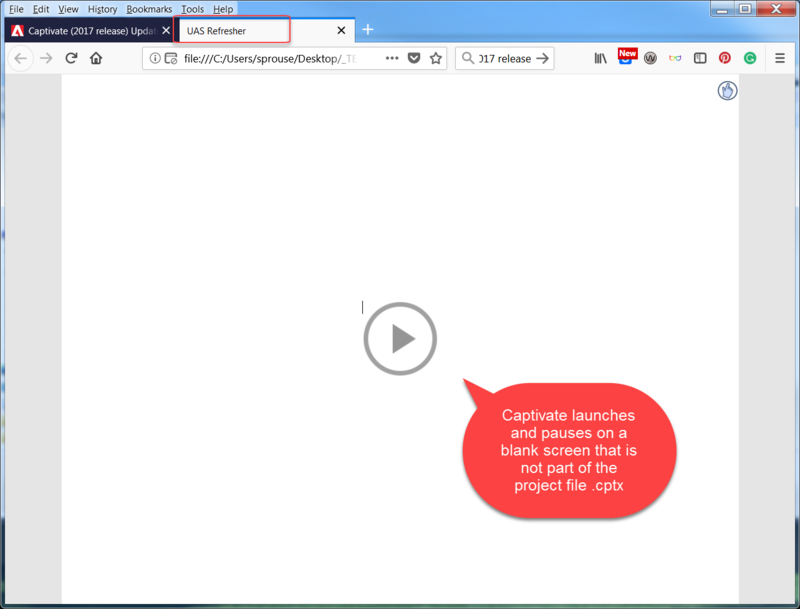 Before I too return to the earlier Captivate version I wanted to reach out to the community to see if there is something that we need to do to 10.0.1.285 to force Captivate to publish the project as expected. The post HTML5 export launching blank screen at beginning of published project appeared first on eLearning. If you have an active subscription for Adobe Captivate, you are eligible to upgrade to the recently released 2017 release of Adobe Captivate as part of your subscription. Windows: Navigate to Control Panel and select Programs. Now choose the version of Captivate you wish to uninstall and click Uninstall. Mac: Navigate to Applications > Utilities > Adobe Installers and select the uninstaller for the version of Captivate you wish to uninstall. Download Adobe Captivate 2017 from the list of links in the document, Captivate downloads. Once the files are completely downloaded, double-click to start the extraction and follow the on-screen prompts to install the product. During installation, you would be prompted to sign in using your Adobe ID. Enter the Adobe ID and password for the account for which you have an active subscription to Adobe Captivate. Follow the on-screen instructions to complete the installation. On successful installation, launch Adobe Captivate 2017.